What are Structural Insulated Panel Homes Like? You are here: :Home|Posts|Build a Log Home|What are Structural Insulated Panel Homes Like? Structural insulated panel homes may go up faster, save you lots of energy over the years and give you a really strong house. What are they like to live in? 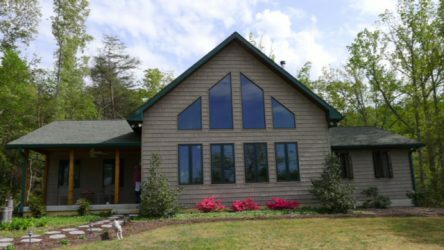 We have lived in a number of homes, and my all-time very favorite home was that hybrid timber frame home in Virginia. There are a number of reasons for that. 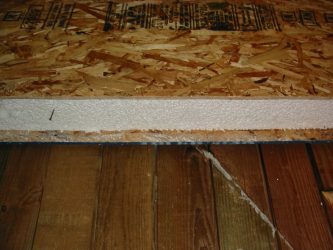 A structural insulated panel has rigid foam sandwiched between OSB boards. Comfortable – Ever live in a drafty house? You’re cold all winter when the wind blows. I know I’m cold when it’s drafty! Structural insulated panel homes are NOT drafty. You’ll be cozy and warm, even when the temperature dips below zero, with the wind blowing outside. And, in the summer, you’ll be cool and comfortable. In Virginia (where the temperature frequently went into the high 90s in the summer, we turned the air off during the evening hours, and didn’t turn it on again until noon. And we were always comfortable. Your structural insulated panel house will maintain a comfortable temperature. Acoustics – This may seem like a silly thing to include, but acoustics are important when you enjoy music and conversation. You will not hear echoes from other rooms when you live in a SIP home. Security – Structural insulated homes are secure in a couple of ways. Did you ever think about how easy it would be to simply saw a hole in a stick built house to burglarize it? It’s pretty scarey. While not impossible, it would be a lot tougher to saw a hole in the side of a structural insulated panel home. Protection from Weather – Storms are an issue along coastal areas in Virginia. Even when we were hit directly by hurricanes, we did not have damage to our home there. In one hurricane, we had 10 trees go down, 15 feet from our house, with no damage to our home. Structural insulated panel homes are safer in bad weather, because of the strength of the R-Control panels. They are tested for strength, impact, and ability to hold up to strong winds. My experience was that the system works! We were grateful for a strong and secure home! When you spend time where I lived in Virginia, you’ll soon learn that you are in the Promised Land. But not exactly the one you read about in the Bible. Promises are made, but not necessarily kept—at least not in the promised time frame. People there get things done—but on their schedule. And for those who are used to the fast paced living in northern Virginia or Washington D.C., it seems pretty SLOW. One of the main advantages of building with structural insulated panels (or building a modular home) is that the time for building a home is decreased considerably. This also saves money for construction costs, because construction workers are often paid by the hour (and builders need to charge enough to pay the workers). Structural insulated panel homes look just like other houses. Speed of construction – Ever hear a horror story about a house that took 3 years (or more) to build? With SIPs, the dried in shell (walls, roof, windows and doors) for a 2000 square foot house, is often only 2 weeks. That means you can lock the doors, knowing that the shell is secure. The finishing work will take the same amount of time as any other house. Energy efficiency – Structural insulated panel homes are airtight and energy efficient. The walls are often R-25 and the roof R-38 or more. In tests, SIPs homes were found to be 52.5% MORE energy efficient than homes built to the 1992 Model Energy Code. SIP homes typically save 40-50% on heating and cooling—year round! SIPs look normal – If you are a Baby Boomer, you may remember that energy efficiency was big during the 1970s. But, if you built a home designed to be super energy efficient then, your home probably looked squirrely. Remember the underground earth berm houses and the odd looking passive solar houses? The nice thing about SIPs is that you just can’t tell that they are there (inside or outside). The house looks normal. look just like other houses on the outside. Solid construction strength – Structural panels are really strong. Even building along the Chesapeake Bay or the ocean, your home will resist strong winds, even hurricane force winds. Comfort – Very quiet inside, structural insulated panel homes block wind and moisture, and the temperature inside the house is moderated. In the central Virginia climate, often a house stays cool in the summer heat (without AC) until noon. In the winter, if you don’t downsize your heating unit, you may find yourself opening windows—that includes someone like my wife, who’s always chilly in the colder months. Interior walls can move – Because the structural panels are structural, you can put interior walls anywhere. That means, for example, if you need another foot or two in the kitchen (or you want to add a powder room)—you just move the walls. It doesn’t require a major adjustment to your house plans! 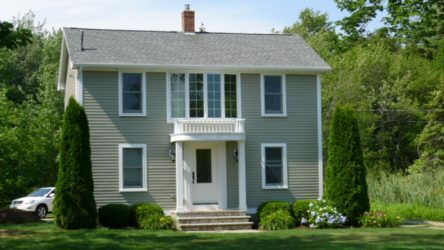 Outside finish – You can use any kind of siding that you like. 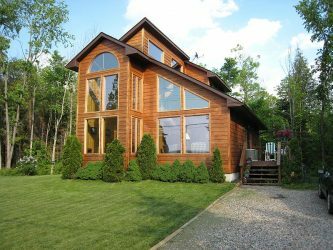 Cedar shakes, log siding (to get that log cabin look), stone, stucco, fiber cement or even vinyl. You get the look that YOU want! Green building materials – the materials used are safe and eco-friendly. There is little waste and using SIPs respects the environment. Structural insulated panel homes look like any other home. The difference is in their performance. With SIPs your home can look like any home you like—both inside and outside. But you won’t get this kind of energy efficiency and flexibility in almost any other kind of home.